His article was rife with accusations and insults against the Dalai Lama and against anyone who disagrees with the ISC’s critical stance towards him, such as The Guardian, Geshe Tashi and the International Campaign for Tibet – that they are all vitriolic, ill-informed or liars. Not only is the leadership of ISC made up entirely of NKT members, but likewise are the vast majority of its rank and file members. Given these facts about the leadership and membership of the ISC, it is not unreasonable to suggest that the ISC is effectively just the latest in a string of political front groups for the NKT, who have been openly targeting the Dalai Lama for attack since 1996. 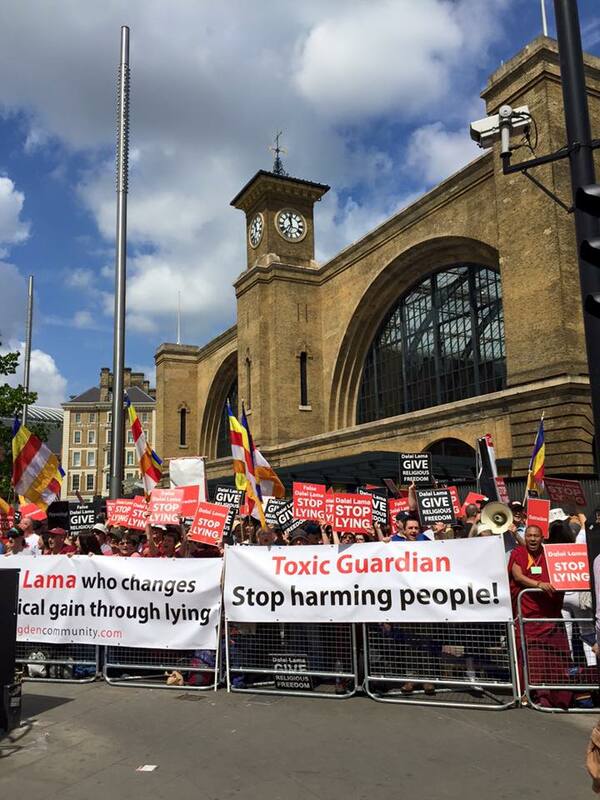 NKT/ISC protest close to the Guardian building in London on Jun2 27, 2015. Only when The Guardian came under pressure themselves by the protesters The Guardian started to seek advice by an academic expert. Here is their response to the NKT/ISC Guardian Campaign. NKT members, both lay and ordained, are seen protesting at the highest volume they can muster, complete with dozens of drums and megaphones, displaying to the world a disrespect bordering on contempt towards the millions of Tibetans and others who revere the Dalai Lama as a great Buddhist teacher. To blur the image of only westerners’ engagement, the NKT brings in few Tibetans they gather from different places to place them in the front row. At his recent talk in Aldershot Football Stadium, to which people flocked in their thousands, many ordinary and sincere Buddhists – westerners, Nepalis and Tibetans – were prevented from being able to hear and listen to the Dalai Lama speak, due to the huge cacophonous volume of the NKT protesters just outside the stadium gates. The Dalai Lama and most of the attendees kept calm in the face of this provocation, but sadly a few lost their tempers afterwards with the protesters. Their angry reactions were caught on video and gleefully posted online by the ISC, in a manner reminiscent of psychopathic bullies who torment their victims and then gloat triumphantly at their visible pain. So who are the NKT? Is there any truth in their allegations against the Dalai Lama? Or, as many of their critics claim, are these allegations more a case of projection of the faults of their own organisation and their own teacher, Kelsang Gyatso, onto the Dalai Lama? So let’s start with the allegation that the Dalai Lama has created a schism in the Tibetan Buddhist community and restricts religious freedom. Actually, the New Kadampa Tradition itself formed after its founder created a schism in the fledgling FPMT Tibetan Buddhist community in the UK, to start his own “tradition” of Buddhism, which many critics and former members describe as a cult. On the advice of the Dalai Lama, Kelsang Gyatso was invited to teach at the FPMT’s Manjushri Centre in the 1970s, only to promptly repay this kindness by wresting control of the centre for himself and his own purposes, allegedly using shady means to achieve this (see the Good Night Lama transcript). Having usurped control of Manjushri Centre he then set about restricting the religious freedom of its residents by banning the display of any photos of the Dalai Lama there and ordering the removal of all books from the centre’s library, other than his own. Since its inception in 1991, all NKT bookshops stock books by one author only – Kelsang Gyatso. Anyone bringing other books into NKT centres are usually scolded and warned about the danger of polluting the “pure dharma” of Kelsang Gyatso. Any resident of Manjushri Centre who was not prepared to accept Kelsang Gyatso as their one and only teacher, to the exclusion of all other Buddhist teachers, was asked to leave. See the BBC’s documentary “An Unholy Row” for more details on this. Nowadays, if an NKT centre resident studying on one of their programmes lets slip that they are also attending teachings from other Buddhist lamas, this will usually result in summary eviction from the centre. So if you value “religious freedom” joining the NKT is not recommended and the NKT’s charge that the Dalai Lama is a dictator who destroys religious freedom seems highly ironic, to say the least. Now let’s examine some of Pitts allegations in his article. Because Pitts lacks a deep understanding of Tibetan history and Shugden history, not knowing or ignoring its sectarian and divisive character within Tibetan society, he has succumbed to sloppy conspiracy theory thinking, reducing the complex history of Shugden worship in Tibetan Buddhism and society to the false premises of simplistic black and white thinking. What Pitts and the protesters fail to recognise is that the Dalai Lama, as spiritual and temporal leader of Tibet, had no choice but to address the Shugden issue because of its divisive character, in the context of Tibetan society, and because of its marriage with sectarianism and Gelug exclusivism, at the cost of the other Tibetan religious schools. There is no academic paper, nor any established academic expert on Tibetan issues, who does not understand the need that the Dalai Lama had to address the Shugden issue. Their inability to understand or consider the broader context of this issue, demonstrates that Pitts and the protesters cannot put themselves into the shoes of others, but instead view the matter from a narrow, parochial and selfish angle, that clings to its own likes, views and wishes, unable to see the whole picture, including the detrimental effects of Shugden worship for the unity of the Tibetan people. a constant potential for conflict, both within the Gelugpas and between the Gelugpas and the other schools of Tibetan Buddhism. The fact that Shugden is definitely not a protective deity for Tibetan Buddhism in its entirety, but that the followers of other schools reject it, and some even vehemently, is of the utmost importance in understanding the dilemma in which the Dalai Lama finds himself today. According to Hartmann, the Dalai Lama’s “intentions accordingly can be interpreted as that he considers the balance between the different schools as a supreme good, rather than exclusively favoring his own school in the style of a party politician, and that he is even ready to pay for this a high price of massive conflict within his own school. Only by doing so would he be able to fulfill his stated claim to be the Dalai Lama of all Tibetans”. Pitts and the protesters ignore these points. For them Shugden worship is seen as being as innocuous as “The Lord’s Prayer”, because Kelsang Gyatso has taught them a white-washed, sanitised version of the practice that sweeps under the carpet the aspects of it which inspire very real fear among many Tibetan Buddhists. Given their wilful ignorance, in order to explain the Dalai Lama’s rejection of Shugden practice, it seems the NKT Buddhists can barely avoid constructing for themselves a conspiracy theory in which the Dalai Lama has a secret agenda, is an omnipotent and almighty ruler who is slavishly followed by dumb Tibetans, fearing to question him and who are brutally oppressed by this “worst dictator of the 21st century”. Interestingly, the exiled Tibetans who live all over the world in freedom stream in their thousands to the Dalai Lama’s teachings. The vast majority of Tibetans love this “worst dictator of the 21st century” deeply, and are greatly offended by the actions of the protesters. Yet according to Pitts, probably the Dalai Lama has just manipulated them or maybe Tibetans are just stupid? This accusation [of suppressing freedom of religion] makes no sense … the Dalai Lama is not head of any state; he has no military or police at his command; he has no political jurisdiction over which he can exercise suppression. … Some members of the Gelug sect left the authority of the Dalai Lama in order to follow what they see as a purer form of religion. These people may not be very popular … but their human rights have not been violated, nor their freedoms suppressed; even if some people did want to suppress or silence the pro-Shugen side, they simply have no means of doing so. Dr Nathan Hill is not alone in this assessment either. The protesters and some Shugden activists in India have taken their claims of human rights abuses to organisations like Amnesty International and the High Court of India, but no authority beyond themselves has found any evidence to back their claims of persecution and human rights abuses. In fact, there exists a thriving minority of Tibetan monks in India who reject the Dalai Lama’s advice on Shugden. Contrary to the protesters oft-repeated claim, none of these monks were made homeless. The ISC circulate a deceptive propaganda video entitled “Exiles in Exile” which, complete with violin music, shows children wandering dusty streets with begging bowls, while the voice-over claims they are homeless due to the Dalai Lama’s “ban”. It turns out that the footage is of young Burmese monks doing traditional alms rounds, not Tibetan monks at all, let alone homeless Shugden monks. For the truth is no Shugden monks have been made homeless. The Shugden-worshipping and non-Shugden worshipping monks took a vote and decided, in effect, to “divorce”. Each group was given their fair share of monastic property and resources and the Shugden monasteries in India are now thriving, well-funded, beautiful places, by all accounts. Nor have there been any police reports or independent media reports of any of the abuses they claim. On the other hand, there have been several police reports of attacks by Shugden worshippers on Dalai Lama followers and there are still Interpol Red Notices on two Shugden worshippers, wanted for questioning regarding murder crimes. Amnesty International’s report could even be interpreted as a mild rebuke to the Shugden group, insofar as their campaign deflects media attention away from the very real persecution and abuse of human rights being suffered by Tibetans in Tibet at the hands of the Chinese regime there. Pitts also alleges that the Dalai Lama has an “elaborate public relations machine, financed by the millions he shamefully earns from Buddha’s teachings”. This is just not true. On the Dalai Lama’s website it states “as a long-standing policy His Holiness the Dalai Lama does not accept any fees for his talks”. Our call to the media is this: please be more careful and seek the expertise of the academic disciplines of Tibetology and Buddhist Studies when it comes to reporting on the complex religious, political and social issues of Tibet. There is already too much inaccurate information and confusion out there and it benefits nobody when the media helps spread extreme religious views without challenge. Linda Ciardiello is a former member of the New Kadampa Tradition. Linda Ciardiello also wrote How ‘Kadampa Buddhists’ (NKT) Use Systematic Fraud to Manipulate Twitter Trend Statistics. Extremely clear, convincing piece that gets to the truth of the matter. All the more impressive when I arrived at the end of the article only to discover the author was an ex-NKT member…which, for me personally, lends the piece yet more weight. I whole-heartedly agree that the media has to do a far better job at ferreting out the facts from the lies and the distortions. The lengths they will go to, i.e., filming monks doing their alms rounds and then deliberately twisting that into a completely made-up story about monks made homeless by the Dalai Lama’s ban. This is who they’re/we’re dealing with. Unethical doesn’t even cover it. It still leaves the the very real issue that religious discrimination exists against Dorje Shugden practitioners, for instance when people have had death threats by telephone in the USA. Also, having been there myself in Aldershot, standing at the front when the Dalai Lama left, I witnessed extreme aggression towards myself and the other maybe 40 people around me because we are Shugden Buddhists. The prejudice exists. The Dalai Lama doesn’t directly address this issue when it clearly is, atleast, partly his responsibility to do so. Every person has the right to freely choose which religion/religious practice to follow…it actually states that on the CTA website. They “supposedly” follow International Human Rights Law….I say “supposedly” because they and the Dalai Lama don’t. They are opposed to religious freedom and tolerance. Let’s get one thing straight Carol. Any aggression levelled towards the anti-Dalai Lama protesters at Aldershot was not because you worship Shugden. It was because, by many accounts of those who were there, the cacophonous yelling with which you assaulted their ear-drums and with which you prevented EVERYONE from being able to listen as they wished to a great Buddhist teacher, likely left a lot of people mightily fed up and some mightily angry too. Your behaviour on that day was outright bloody-minded and selfish – for many there you destroyed what should have been a peaceful and joyful day. Just listen to this video and imagine the tables were turned and you were trying to listen to Kelsang Gyatso speak, while 500 Tibetans stood outside your open air venue with megaphones and drums yelling “Kelsang Gyatso Stop Lying!” Imagine it! Go on! In your mind’s eye visualise the scene, make it louder, make it bigger, make it brighter, listen to the yelling over and over like a deadeningm soul-destroying, hypnotic chant, disturbing your peace, preventing you from hearing “Geshe-la’s” words….Go on! imagine it! Hey Carol, it is your and the protesters’ unsubstantiated claim or fiction that there is a “real issue that religious discrimination exists against Dorje Shugden practitioners”. Nobody approved these claims, except yourself. Not any human rights group approved your claims. Of course there are cases of discrimination here and there and they should be addressed but you all blow this up unreasonably. I am tired of these “death threat” claims, if they really exist prove them and go to the police. These claims blur the real issue that is the real killing of Shugden opponents (triple murder), the trial to kill the assistant of Trijang Chogtrul Rinpoche in order to put the blame onto the Dalai Lama, and the imprisonment of Shugden opponents in China. Not any Shugden supporter has been killed or imprisoned. Get real, tune into facts and go beyond fiction please. Also, having been there myself in Aldershot, standing at the front when the Dalai Lama left, I witnessed extreme aggression towards myself and the other maybe 40 people around me because we are Shugden Buddhists. The prejudice exists. C’on, what is about your own aggression and bullying tactics, the shoutings and use of abusive language? With these stalking and bullying tactics you win only mean friends but not good friends. Don’t play the victim card but see how your own actions make you an outsider. People won’t like you if you abuse terms of human rights, religious freedom to bully a respected spiritual leader. You shot yourself in your own foot and now the others are at fault? You’re a “poor me”? The Dalai Lama doesn’t directly address this issue when it clearly is, atleast, partly his responsibility to do so. Every person has the right to freely choose which religion/religious practice to follow…it actually states that on the CTA website. They “supposedly” follow International Human Rights Law….I say “supposedly” because they and the Dalai Lama don’t. They are opposed to religious freedom and tolerance. Carol, the NKT don’t receive aggression because they worship dogyal, they receive other people’s aggression because they run a deliberately provocative hate campaign against the Dalai Lama, who is seen by Tibetans as their best asset in the face of imprisonment, torture and murder by the Chinese government. Some Tibetans see that the Dalai Lama has kept the plight of Tibet in the attention of the world’s media and governments and when they see a bunch of ill-informed and misled foreigners shouting about things they don’t understand and have no real evidence of, they may get a little upset. This is understandable. Carol, your lineage lamas were very opposed to religious freedom and tolerance. Pabongkha wrote that other traditions were faulty and dangerous and lead to hell and that dogyal will kill any high gelugpa lama or government official that takes these teachings. Maybe a person that continues propitiating this violent sectarian ‘protector’ isn’t well qualified to lecture others on religious freedom and tolerance. Very good, Linda, but I would disagree with one aspect. You say the NKT are ignorant of the divisive, sectarian nature of dogyal, but I’m not sure this is true. The NKT say the Dalai Lama has ‘banned’ dogyal for his own political ends but they never really explain how that works. Why would advising against a peaceful lovely Buddha help the Dalai Lama’s Machiavellian political ambitions? This only really makes sense if in some way the dogyal cult opposed the Dalai Lama or prevented him realising his goals, but how? I know what you’re thinking. “Surely a highly respected geshe and totally sane qualified spiritual guide could not have come up with an absurd paranoid conspiracy theory like that?” Well, maybe he was having a bad day. Anyway, his theory goes, the Dalai Lama gets rid of dogyal and then is able to mix up all the Tibetan traditions and become the daddy of them all. So, implicit in kelsang’s paranoid rant is the understanding that dogyal would stop this mixing, and I suggest also there is the understanding that if the Dalai Lama continued to propitiate a sectarian harmful spirit no follower of any other tradition would touch him with a barge poll let alone praise and honour him, and that is probably true. But all this entails the understanding that dogyal is hostile to non-sectarianism, and other traditions are hostile to dogyal. This is probably why the NKT say the Dalai Lama is acting out of political intentions without explaining what those intentions are. There are, of course, pretty obvious reasons why kelsang’s paranoid rant is nonsense. The Dalai Lama hasn’t mixed all the traditions up and he is not the head of all Tibetan Buddhism. Kelsang wrote that BS in 1997 and in that time the Dalai Lama has stepped down from his political role rather than making any grabs at power. It is arguably true (with a few minor exceptions) that the various Tibetan religious traditions are getting on better now than ever before, mutually coexisting whilst being autonomous and looking after their own affairs. The Dalai Lama’s actions over the years has helped that, but he has not promoted himself in the process. Instead he has taken an increasingly lesser role. I think the NKT’s inability to understand non-sectarianism is really at the root of this, and their view that, like kelsang gyatso, every lama is really just acting with base motives of selfish greed and power. Interesting analysis Dorje. The defining hallmark of every accusation and insult the NKT protesters throw at the Dalai Lama and at critics of the NKT like myself, is that it is all a projection of their own faults, as I said in my post. As an example, this post came about because I was invited to write a response to Rabten’s piece in #LanchesterReview, after a row on Twitter where it was proven that @tompotter45 was circulating a bare-faced lie in the form of a meme which said that the Dalai Lama is preventing children from receiving schooling because they are Shugden worshippers. David Lindsay, the editor of Lanchester Review leapt at this false story offering to publish it on his blog, whereupon I asked him if he was going to publish another article like the Rabten one, full of unchallenged lies? So he grudgingly said I could send in a response to the Rabten piece (only to then reject it on the grounds that he considered it badly written and badly put together). However, the #NKT bots started grumbling about the article before I’d even written it – saying I wouldn’t be allowed to “tell lies and expect to get away with it”!! Oh the irony! That is exactly what @tompotter45 had been doing with that meme which was a total, bare-faced lie! Incredible really – it beggars belief that these people can consider themselves right-minded “Buddhists” while behaving with such hypocrisy and dishonesty. Thank you and thanks to Linda who wrote it.